HomeSocial Media Instagram, Algorithms and Shadow Bans – Oh My! Instagram, Algorithms and Shadow Bans – Oh My! If you’ve noticed a change in the posts you see on Instagram, there’s a reason. Instagram changed its algorithm (again). Much like Facebook and Twitter, Instagram has its own set of rules on how it operates, including which posts you see while scrolling through your feed. One major change is causing older posts to show up in the feed before newer ones. Sorry, but your followers may not see that giveaway post you just did. It’s pretty simple, if you can speak the language (or read a blog post that explains it to you). Basically, a new is post is first shown to a small percentage of your followers. Then, Instagram reviews the engagement (likes, comments, shares, etc.) on your new post and compares it with the engagement from your previous posts. From this point on it’s essentially a March Madness bracket. Each post goes head-to-head and whoever has the most engagement wins the honor of showing up in the rest of their followers’ feeds. As a PR and marketing agency in Phoenix, we needed to get to the bottom of this. According to the overlords at Instagram, the algorithm wants to support more organic, honest content that is relevant to what viewers want to see. If it takes your followers’ feedback (engagement) for a post to gain more traction, then you have to put a little more thought on how to make each post better. If your business chooses to repetitively ignore these guidelines, it could fall victim to the dreaded shadow ban (dun dun DUUUUUN). Shadow bans are super annoying for businesses, because you might not even know it’s happening. A shadow ban is when Instagram blocks or reduces an account’s reach for being too spammy, repetitive, or bot-like. Think of it as a passive aggressive form of protest. Being shadow banned means you are invisible to everyone except your current followers. This is similar to the way Facebook company pages currently work, and can happen without the account owner knowing (*cough* passive aggressive *cough*), and can last until the behavior is changed. 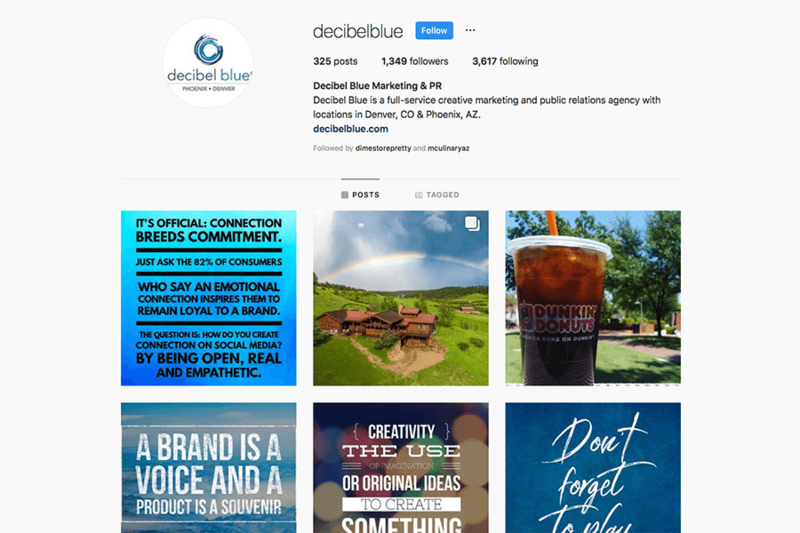 Here are some tips from our marketing agency in Phoenix to avoid making your account the target of a shadow ban. Create different sets of hashtags to use. Using the same string of hashtags in every post might reinforce the use of those hashtags, but it ultimately doesn’t help the user find out more about the account. You can still use the list approach to hashtags, just have a few in rotation to avoid being flagged. Only use hashtags relevant to your business’s content and audience. If you say #surfsup on your photo of a Catholic mass, not only is it irrelevant but it’s also the type of behavior that can get you shadow banned. Keep your tags relevant to maximize your reach. Interact and engaged with comments and likes on your posts. Instagram is smart, but at the end of the day it’s just a bunch of code that can only count the number of comments and likes on a post. So if someone comments on your post and you reply to the comment, you now have two comments – phew, that was easy. Of course, your engagement must (and should!) be sincere. Don’t engage just ‘cuz. Learn about banned hashtags and avoid using them. Of course, using these hashtags may not result in a shadow ban, but it’s important for you to know the risks and how these seemingly small updates to the algorithm can affect your reach on social media. Lastly, watch out for the signs. If you want to make sure you aren’t shadow banned, keep a close eye on engagement. If you notice a dip or lull, change up your strategy! Social media is now a full-time gig, and part of that gig is getting comfortable with trial and error. And if you’re not able (or let’s face it, willing) to focus your attention on social full time, give us a ring. We’d be happy to help. Adam is a Senior Trainee at Decibel Blue. Whether overseeing social accounts, sharing blogs, or taking on whatever task the team sends his way, this ASU alum has proven to be an asset to our team. When not in the office, Adam can be found pursuing his passion for travel, cooking, and healthy living – and skateboarding down mountains, too.